^ The Reaction in Germany, Mikhail Bakunin, 1842, In: Bakunin on Anarchy, Sam Dolgoff, 1971, 1980. ^ On the 17th Anniversary of the Polish Insurrection of 1830, Mikhail Bakunin, La Réforme, December 14 1847. ^ Michael Bakunin A Biographical Sketch, James Guillaume. ^ Appeal to the Slavs, Mikhail Bakunin, 1848, In Bakunin on Anarchy, translated and edited by Sam Dolgoff, 1971. ^ My Life, Volume I, Richard Wagner . ^ Confession to Tsar Nicholas I, Mikhail Bakunin, 1851. ^ Bakunin, Yokohama and the Dawning of the Pacific Archived 2007年6月28日, at the Wayback Machine. , Peter Billingsley. ^ Philipp Franz von Siebold and Russian Policy and Action on Opening Japan to the West in the Middle of the Nineteenth Century, Edgar Franz, Munich: Iudicum, 2005. ^ The Narrative of a Japanese: What He Has Seen and the People He Has Met in the Course of the Last 40 Years, Joseph Heco (Narrative Writer), James Murdoch (Editor), Yokohama, Yokohama Publishing Company (Tokyo, Maruzen), 1895, Vol II, pp 90–98. ^ An Unpublished Letter of M.A. Bakunin to R. Solger, Robert M. Cutler, International Review of Social History 33, no. 2 (1988), p 212–217. ^ "Bakunin, Garibaldi e gli affari slavi 1862 - 1863", Pier Carlo Massini, Gianni Bosio, Movimento Operaio year 4, No. 1 (Jan - Feb, 1952), p81. ^ Revolutionary Catechism, Mikhail Bakunin, 1866, In Bakunin on Anarchy, translated and edited by Sam Dolgoff, 1971. ^ Bakunin's idea of revolution & revolutionary organisation, published by Workers Solidarity Movement in Red and Black Revolution No.6, Winter 2002. ^ Bakunin to Nechayev on the role of secret revolutionary societies, Mikhail Bakunin, June 2, 1870 letter to Sergey Nechayev. ^ a b Letters to a Frenchman on the Present Crisis, Mikhail Bakunin, 1870. ^ The Paris Commune and the Idea of the State, Mikhail Bakunin, 1871. ^ Anarchism: A Documentary History of Libertarian Ideas Volume One: From Anarchy to Anarchism (300CE to 1939), Robert Graham, Black Rose Books, March 2005. ^ Anarchism: From Theory to Practice , Daniel Guerin, New York: Monthly Review Press, 1970), pp.25-26. ^ a b c God and the State, Michael Bakunin, 1882. ^ Michael Bakunin: Selected Writings, ed. A. Lehning, New York: Grove Press, 1974, page 268. ^ Man, Society, and Freedom, Mikhail Bakunin, 1871. ^ a b Revolutionary Catechism, Mikhail Bakunin, 1866. ^ Michael Bakunin: Selected Writings, ed. A. Lehning, New York: Grove Press, 1974, p219. ^ On the International Workingmen's Association and Karl Marx, Mikhail Bakunin, 1872. ^ a b c Anarchism, George Woodcock, Harmondsworth, England: Penguin Books, ISBN 978-0-14-020622-7. 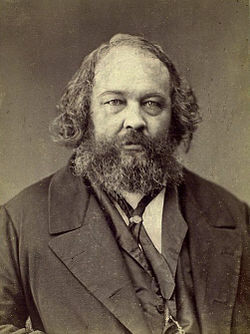 ^ Was Bakunin a secret authoritarian? ^ Bakunin: The Philosophy of Freedom, Brian Morris, 1993, p14. ^ New York Daily Tribune (October 2, 1852) on 'Revolution and Counter Revolution in Germany'. ^ Bakunin: The Philosophy of Freedom, Brian Morris, 1993, p29. ^ Madison, Charles A. (1945). “Anarchism in the United States”. Journal of the History of Ideas 6 (1): 46–66. doi:10.2307/2707055. ^ "Program of the International Brotherhood", Bakunin, 1868, reprinted in Bakunin on Anarchism, ed. S. Dolgoff. ^ Mikhail Bakunin: The Philosophical Basis of His Theory of Anarchism, Paul McLaughlin, 2002, p4. ISBN 1-892941-41-4. ^ Statism and Anarchy, Mikhail Aleksandrovich Bakunin, ed. Marshall Shatz, 1990. ISBN 0-521-36973-8. ^ 'The General Idea of Proudhon's Revolution' , Robert Graham.